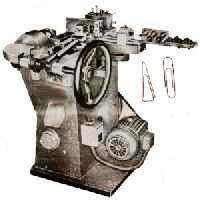 Automatic Jem Clip Making Machine is a good option for Small Business. Anyone may set up a Small Business and can be self-dependent by investing a small amount. It is also a good opportunity to earn a handsome money. The usage of Jems Clip is found in schools, colleges, offices and homes. The necessity or demand of Jems Clip is in everywhere, in educational field or in official work. Jem Clips can be produced through the Automatic Jem Clip Making Machine. Then after packing it you may sell it in the market or you may take orders from stationery stores in your locality and supply them as they require. At first you have to buy wire (cable) from the market. You may afford it from Barobazar Market in Kolkata. Now hang the wire in the stand of the machine. Then put one end of the wire in the bobbin of the machine. Now start the machine. The Jem Clips will be produced automatically when you start the machine. If you want to make different coloured Jem clip, you have to buy colourful rubber-tubes of your choice. Then you have to fit it in the wire first and put the wire in the bobbin. You may produce Jems Clips in different sizes through dies of different sizes. Through this machine, you can produce approximately 100 pieces clips in 1 second. You need 1 horsepower motor and 220 volts to operate the machine. The price of this machine including tow dices and motor is approximately Rs. 1, 10,000. You can find many companies manufacturing a wide range of gem clip making machine. Their machine matches high technology electronic control.